The beginning of spring always seems a little dreary (personally, we don’t love the constant drizzle, even if we know it’s good for the plants). So here at Murray’s, we’ve been thinking about the best ways to make the season a bit brighter. And what better way of doing it than picking bright, floral, and sweet cheeses to get us in the mood for warmer, sunnier days? So, we’ve designed two delectable collections to get us in that springtime spirit! Springtime Splendor is us looking forward to Easter – think chocolate bunnies, caramel sweetness, and flowers in the middle of the table for brunch. That’s where our inspiration came from when putting together this collection. First we took our award-winning Hudson Flower, which is dressed in aromatic flowers and herbs, and full of springtime flavors from the Hudson Valley. Then we add in 2 Year Aged Boerenkaas, which is filled with rich caramel sweetness. Need a little bit more of a tangy dessert after Easter brunch? Jasper Hill’s Bayley Hazen Blue has notes of dark chocolate within the tangy, piquant blue. But a springtime feast is more than just cheese! How about a few dollops of Murray’s Strawberry Rhubarb jam? Or maybe you could spread those delectable cheeses on Rip Rap Bakery’s Sea Salt Crackers. Finish it up with a handful of colorful and rich Chocolate Malted Milk Balls – decorated as beautifully painted pastel Easter eggs. Meanwhile, we’re dreaming of sunshine, so we put together a trio hoping that it’ll come soon! We love the fresh, green grasses and warm breezes of spring, and of course, bloomy rind cheeses! We chose one of our favorites for this trio, Sweet Grass Dairy’s Green Hill, which is silky and creamy and loaded with rich, buttery notes. When you dollop a spoonful of Serramel Lemon Curd on top of the Green Hill, it’s like being hit with sunshine, adding a custardy tart bit of citrus to the mix. 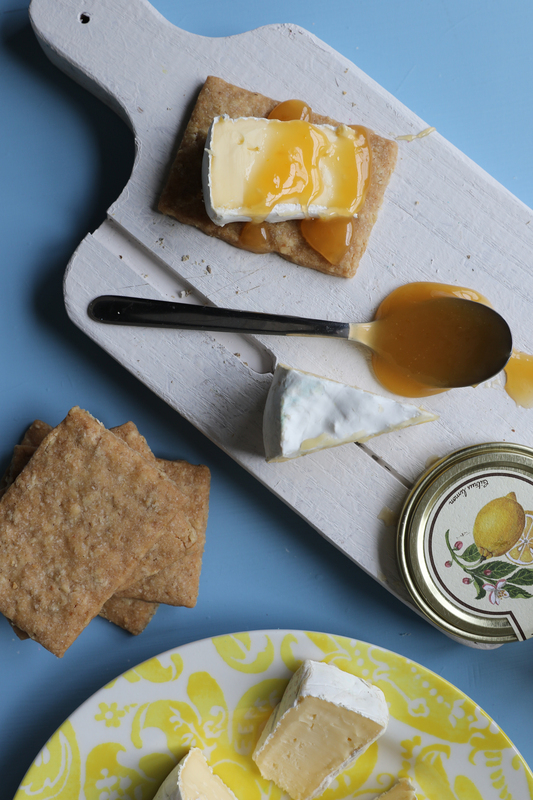 We like to spread both over Effie’s Homemade Oatcakes – think of it as a nice picnic to celebrate that spring is here and (hopefully) will be blooming soon! Did we get you in the mood for Spring yet? 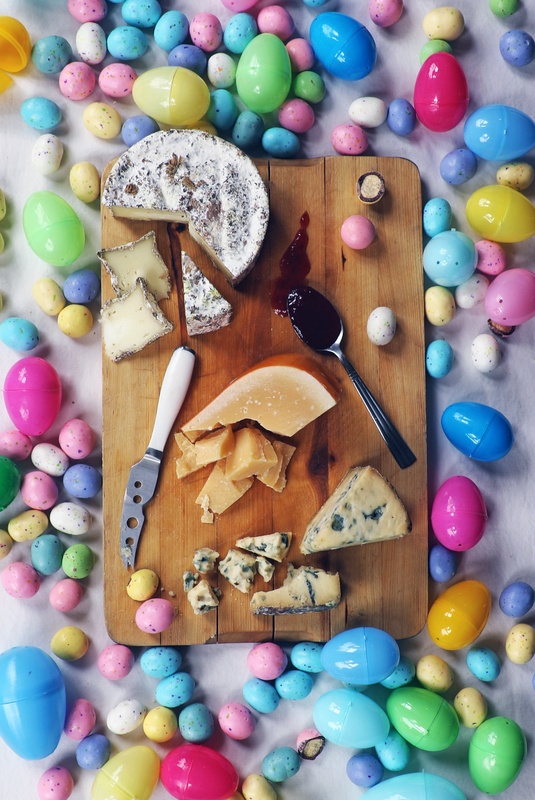 Even if the weather isn’t acting like it, we hope you can welcome in the season the best way we know how – full of bright, sunny cheeses and sweet delights. Next PostNext An Egg-cellent Easter Dessert Pairing!